This month, Juan Villa, Pratap Ramamurthy, and Roy Rodan from the Emerging Partner SA team highlight a few of the partners they work with. They’ll be exploring Microchip, Domino, and Cohesive Networks. AWS IoT is a managed cloud platform that enables connected devices to easily and securely interact with cloud applications and other devices. In order for devices to interact with AWS IoT via the Message Queue Telemetry Transport (MQTT) protocol, they must first authenticate using Transport Layer Security (TLS) mutual authentication. This process involves the use of X.509 certificates on both the devices and in AWS IoT. A single certificate contains a private and a public key component. An IoT device needs to store the private key that corresponds to its certificate in order to establish a TLS connection with mutual authentication. Private keys can be somewhat difficult to store securely on IoT devices. It’s easy to simply store data on a device’s local memory, but this is not enough to protect the key from tampering. It’s quite easy, and affordable, to purchase the necessary hardware to read the content of the memory from most microcontrollers and memory components used on IoT devices. This means that private keys used for authentication and establishing trust need to be stored in a secure manner. This is where a secure element chip comes in! Microchip, an APN Advanced Technology Partner, is a silicon manufacturer that makes a secure element chip called the ATECC508A. This chip has a hardware-based secure key storage mechanism that is tamper-proof. In fact, once a key is stored in the ATECC508A, its contents cannot be read. The chip accomplishes this with hardware-based cryptographic acceleration features that allow it to perform cryptographic operations very quickly and with power efficiency. When considering ATECC508A for your product, keep in mind that Microchip can preload certificates on the secure element during manufacturing, before delivery. Combining this feature with AWS IoT’s support for custom certificate authorities and just-in-time registration can streamline device provisioning and security. To make this secure element chip easy for you to try out, Microchip makes an evaluation kit called the Zero Touch Secure Provisioning Kit. This kit includes a SAM G55 Cortex-M4 microcontroller, the ATECC508A secure element, and an ATWINC1500 power-efficient 802.11 b/g/n module, and comes with instructions on how to get started with AWS IoT. With this combination of silicon products you can begin testing and developing your next IoT product in a secure fashion. Before you work on your next IoT project, I recommend that you consider a secure element in your design. For more information on ATECC508A, please read the datasheet on the Microchip website. Machine learning, artificial intelligence, and predictive analytics are all data science techniques. Data scientists analyze data, search for insights that can be extracted, and build predictive models to solve business problems. To help data scientists with these tasks, a new set of tools, like Jupyter notebooks, as well as a wide variety of software packages ranging from deep learning neural network frameworks, like MXNet, to CUDA drivers, are becoming popular. Data science as a field is growing rapidly as companies increase their reliance on these new technologies. However, supporting a team of data scientists can be challenging. They need access to different tools and software packages, as well as a variety of servers connected to the cloud. They want to collaborate by sharing projects, not just code or results. They want to be able to publish models with minimal friction. While data scientists want flexibility, companies need to ensure security and compliance. Companies also need to understand resource how resources like data and compute power are being used. 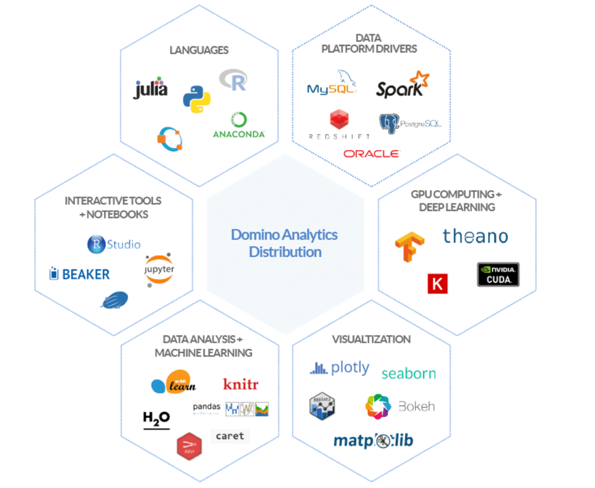 Domino, an APN Advanced Technology Partner, solves these challenges by providing a convenient platform for data scientists to spin up interactive workspaces using the tools that they already know and love e.g., Jupyter, RStudio, Zeppelin, as well as commercial languages like SAS and Matlab, as seen in the diagram below. In the Domino platform, users can run experiments on a wide variety of instances that mirror the latest Amazon EC2 options provided by AWS, as seen in the screenshot. 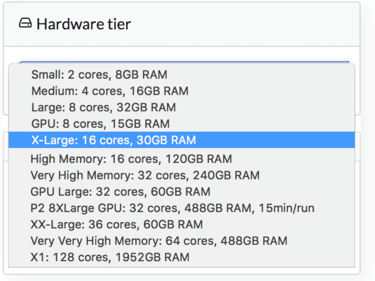 Customers can run a notebook on instances with up to 2 TB of RAM with the AWS X1 instance family. If more computational power is needed, you can switch the same notebook to GPU instances as necessary or connect to a Spark cluster. Because the software used for data science and machine learning has several layers, and new software technologies are introduced and adopted rapidly, the data science environment is often difficult to deploy and manage. Domino solves this problem by storing the notebooks, along with the software dependencies, inside a Docker image. This allows the same code to be rerun consistently in the future. There is no need to manually reconstruct the software, and this saves valuable time for data scientists. Domino helps data scientists share and collaborate. They have introduced the software development concepts of code sharing, peer review, and discussions seamlessly into the data science platform. For companies that have not yet started their cloud migration, Domino on AWS makes data science an excellent first project. Domino runs entirely on AWS and integrates well into many AWS services. Customers who have stored large amounts of data in Amazon S3 can easily access it from within Domino. After training their models by using this data, they can easily deploy their machine learning model into AWS with a click of a button, and within minutes access it using an API. All of these features help data scientists focus on data science and not the underlying platform. Today, Domino Data Science Platform is available as a SaaS offering at the Domino website. Additionally, if you prefer to run the Domino software in your own virtual private cloud (VPC), you can install the supporting software by using an AWS CloudFormation template that will be provided to you. If you prefer a dedicated VPC setting, Domino also offers a managed service offering, which runs Data Science Platform in a separate VPC. Before considering those options, get a quick feel for the platform by signing up for a free trial. Many AWS customers have a hybrid network topology where part of their infrastructure is on premises and part is within the AWS Cloud. Most IT experts and developers aren’t concerned with where the infrastructure resides—all they want is easy access to all their resources, remote or local, from their local networks. So how do you manage all these networks as a single distributed network in a secure fashion? The configuration and maintenance of such a complex environment can be challenging. Cohesive Networks, an APN Advanced Technology Partner, has a product called VNS3:vpn, which helps alleviate some of these challenges. The VNS3 product family helps you build and manage a secure, highly available, and self-healing network between multiple regions, cloud providers, and/or physical data centers. VNS3:vpn is available as an Amazon Machine Image (AMI) on the AWS Marketplace, and can be deployed on an Amazon EC2 instance inside your VPCs. One of the interesting features of VNS3 is its ability to create meshed connectivity between multiple locations and run an overlay network on top. This effectively creates a single distributed network across locations by peering several remote VNS3 controllers. The setup process is straightforward and well-documented with both how-to videos and detailed configuration guides. Cohesive Networks also provides a web-based monitoring and management system called VNS3:ms in a separate server, where you can update your network topology, fail over between VNS3 controllers, and monitor your network and instances’ performance. See the VNS3 family offerings from Cohesive Networks in AWS Marketplace, and start building your secured, cross-connected network. Also, be sure to head over to the Cohesive Networks website to learn more about the VNS3 product family.